This page will help you to create new users as well as add book codes to new and existing users' accounts. For more help see our how to videos which will give you a step-by-step guide to completing and uploading records. You must use the template to upload new users or edit existing users. 1. Click on the Manage users button. Please note that the spreadsheet is sensitive to changes and particular characters. For the spreadsheet to parse the upload process, you are unable to add/remove columns. • user type (column F) this is either "Teacher" or "Student"
All columns have comments providing additional guidance. 3. Enter the information into the required fields (see Fields on Download Template section for more details). 4. For new users you need to include a password (column E), this can then be changed by the user. 5. Book Codes can be added into column K.
You can only enter one book code in a cell. Book codes should appear exactly as they appear in your order. To add codes to existing users, you need to export existing users’ information. 6. Click on the Import/export options button. 7. Click on Export – XLSX. This downloads a spreadsheet with your existing users in it. 8. Copy the users’ information you want to amend or add codes to. 9. Paste the user information into the Download Template (see Fields on Download Template section for more details). For existing users you don’t need to include passwords in column E.
10. Book Codes can be added into column K.
You can add more than one code to a user’s account in the same spreadsheet, but not in the same row. To add more than one code in the same spreadsheet you need to duplicate the user’s information into a new row. 12. Book Codes can be added into column K.
13. For new users, you only need to add a password the first time you add this user. 17.Click on Validate to see if the spreadsheet passes. The total number of valid and invalid users are included. 18. If there are any invalid users click the Download report button to find out the issues (see the Common issues section for more details). 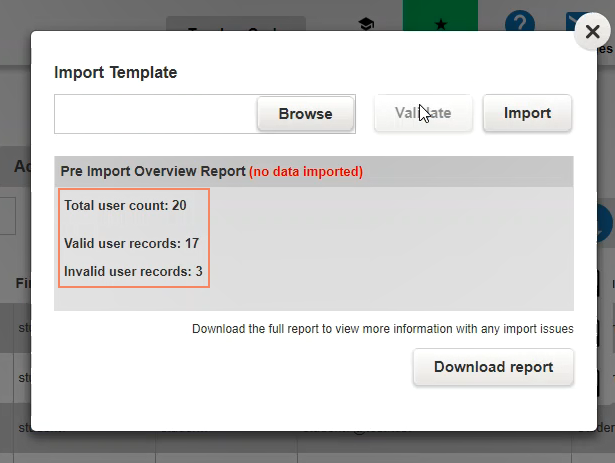 After importing, you may see ‘Invalid user records’ in the Overview Report area. To find out about these issues in more detail, click Download report. Any issues will be highlighted in red in the report spreadsheet, Remarks (column L) has specific information about issues. Username errors Special characters (e.g. @) are not allowed in the username. If special characters have been used, the spreadsheet will not validate and cannot be uploaded. Remove special characters from the username. Added or removed columns from the template spreadsheet Some of the columns do not match the Download Template. Download new template and transfer information across. Book code not applied The user is not within the 90 day renewal period for this title. Wait until the user is within the 90 day renewal period (and can see the yellow expiring badge on the title) before adding a book code. "Unable to parse the uploaded file. Please try again" This could be a combination of the above issues. Check for special characters in the username and download a fresh template. Once corrections have been made reimport and validate the spreadsheet. When the upload is complete, you will see all of the users on your account and users will be able to see books that have been added to their accounts.